Two journalists embarking on a year's adventure in Greece just as the country faces economic collapse seems foolhardy butit'stheir decision to bring their crazy Jack Russell to a crisis-weary countrywithzerodogtolerance that tips the plan into actual madness After an Arctic winter, a recession, and a downturn in the newspaper industry, two journalists and their dog embark on an adventure in the wild and beautiful southern Peloponnese. A perfect plan, except for one thing Greece is deep in economic crisis. And if fiscal failure can't overturn the couple's escapade in rural Greece, perhaps macabre local customs, a scorpion invasion, zero dog-tolerance, health scares, and touchy expats will. 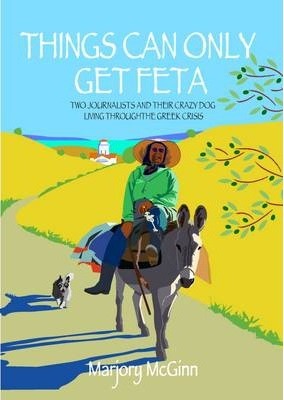 This is a humorous and insightful journey through one of the last unspoiled regions of Greece. It is full of encounters with warm-hearted, often eccentric, Greeks who show that this troubled country still has heroes, if not euros. In a hillside village in the Mani, the locals share their lives, their laughter, and their stories, and help chart the couple's own passage back to happiness. They even find a place in their hearts for their Greek nemesis the local pungent goat cheese. Things really can only get feta." "An honest view of 'away-from-it-all' life in Greece today . . . entertains and informs in equal measure. Highly recommended." --Peter Kerr, author, "Snowball Oranges"
Marjory McGinn is a journalist who haswritten forthe "Daily Mail, " the "Scotsman," and the "Times.""